In a story reported on Hudson County View earlier today, Councilman Michael Russo endorsed Freeholder Anthony "Stick" Romano for mayor. Today's decision to endorse Anthony Romano for Mayor of Hoboken, along with his slate of council candidates, is the best decision we can make," Russo said in a statement. Third Ward Councilman Michael Russo (l) endorsed Freeholder Anthony Romano for mayor earlier today. 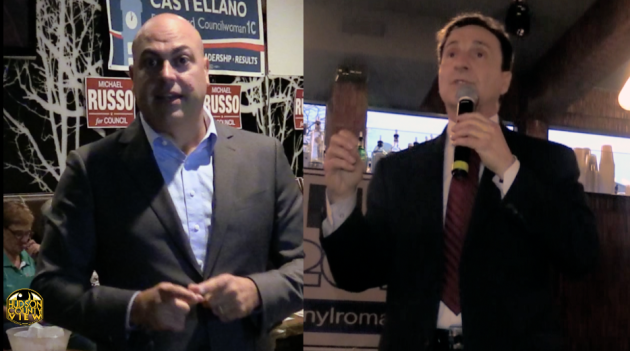 Talking Ed Note: HCV correctly notes in its story, this is not a surprise being that Michael Russo "came out from the cold" and finally threw in behind Romano showing up at his recent fundraiser. It's a blow to the Old Guard backing Mike DeFusco who sought Russo's political support. Russo's cousin and godmother, former first ward councilwoman Terry Castellano would have been more than a trite displeased had Russo backed Mike DeFusco for mayor. In 2015, Castellano was replaced by DeFusco who used the support of Mayor Zimmer to get elected. Russo is a well known and controversial political figure who was captured in 2009 on FBI surveillance video agreeing to a bribe with an undercover FBI informant Solomon Dwek. Russo was not arrested and the plan to make payment was allegedly not consummated. Some wonder otherwise and question if a deal for cooperation with the government didn't follow. MSV's earlier reporting on Russo's comments back in 2011 denying any bribe directly led to the FBI video's release. An earlier March 2011 MSV story broke the story opening the Russo-Dwek controversy. In 2012, MSV published a theoretical timeline on the Russo-Dwek Affair. Russo was re-elected as third ward councilman in 2011 and ran unopposed to re-election in 2015.